Check out this list of every Montessori myth, misunderstanding, and complaint that’s out there. (At least every one I could find.) There are answers, and room for discussion, too. Come join in! The infamous myths. Below I hope to dispel the confusion and shine a little light on the beauty and truth of the Montessori method of education. But first, an important note: No Montessori classroom is perfect. No Montessori guide is perfect. Some schools and guides are less perfect than others. If you had a bad Montessori experience, don’t take it out against the whole method. Please. There is value in the Montessori philosophy. Take a second look. Myth #1: Kids in Montessori classrooms do whatever they want. The Montessori method is designed to give children freedom within limits. For example, children are allowed to choose what they will work on each day, but they have to choose work that has been already been presented to them. Myth #2: Kids in Montessori classrooms never learn to do the necessary things that they don’t want to do. Truth: Kids in Montessori classrooms have to clean up even if they don’t feel like it. They wait their turn even if they don’t feel like it. They finish one activity before moving on to the next. They receive lessons from the guide and learn to obey. This combination of free choice and obedience helps them develop both initiative and discipline. Myth #3: Montessori guides aren’t supposed to tell children what to do. Truth: Montessori guides do give commands to children. Maria Montessori wrote about the three levels of obedience, and encouraged parents and teachers to help cultivate true obedience in children. Read more about that here. 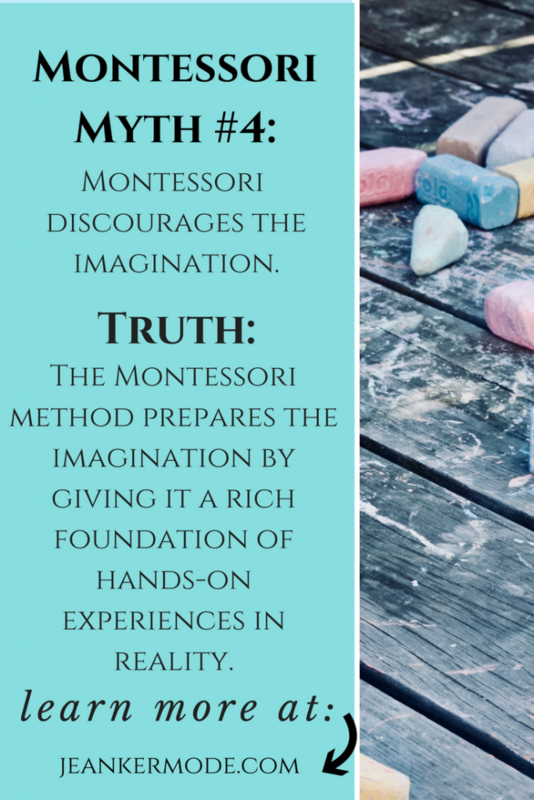 Myth #4: Montessori discourages the imagination. Truth: Maria Montessori believed that the imagination has a foundation in reality, and so young kids need rich experiences in reality first to prepare their imaginations. This is why you won’t find fantasy books in Montessori classrooms for children ages 0-6. You might wonder what this means for fairy tales. Get my take on that here. Myth #5: Montessori discourages creativity. Truth: Creativity flourishes in the Montessori environment, because of the balance of freedom and limits. While you won’t find Montessori guides doing many group crafts, you will find them teaching artistic techniques. Read more about creativity in the Montessori method here. Myth #6: The Montessori method is too rigid and structured and not enough fun. Truth: There is a structure to the Montessori method, but the words of Maria Montessori, “follow the child,” take priority. A good Montessori guide will carefully observe each child to know which lessons he is ready for, and which activities might interest her. The guide sees where in the structure each child is at each moment. This structure is important for young children especially, as they are still getting to know the world and their place in it. External order leads to internal order, and a structured environment allows children to order the many impressions absorbed into their minds. The Montessori method can be implemented too harshly, but this would not be to follow the core philosophy. Music, movement, dance, funny rhymes, laughter, and everything that children truly love and that respects their development has a place in the Montessori classroom. Respect for the child lies at the heart of the Montessori method, and this respect is often lacking in dumbed-down kid activities and songs. The Montessori method looks deep into the heart of the child and offers real excitement, wonder, discovery, and joy. 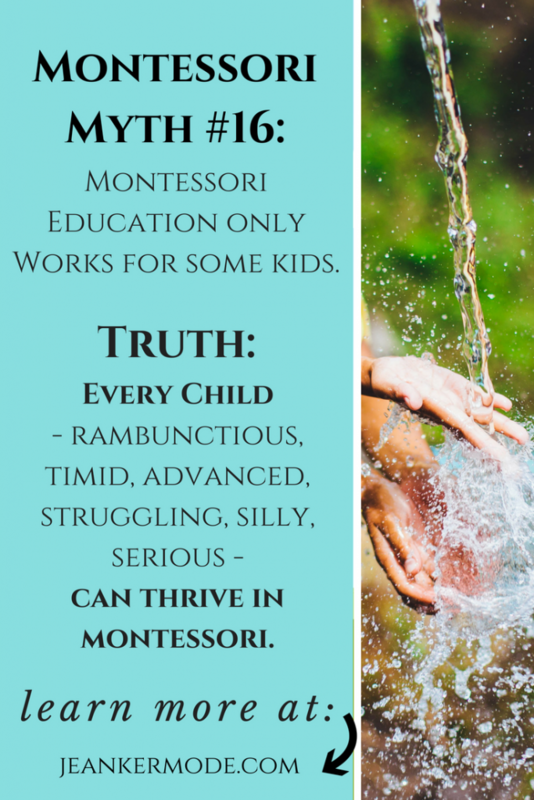 Myth #7: The Montessori method is not structured enough. Sometimes a Montessori classroom can seen unstructured, because of the emphasis on following the child, and the fact that children can choose their work. However, the lessons that the guide gives the children follow a carefully planned structure. The classroom itself is very structured as well, and each material is carefully kept in the exact same place for the whole year. The children do have a three-hour work period where they can choose their work, but a routine exists around and through this work-period. The children have a morning routine, a snack routine, a routine for using the bathroom, a lunch routine, etc. Myth #8: Montessori classrooms are too chaotic. Truth: At the beginning of the school year, things can seem chaotic as children learn the routines and build up their repertoire’s of lessons. However, a good Montessori classroom will calm down, getting closer to and maybe achieving “normalization” within a few months. The goal is a classroom where the children know the routines, choose work that captures their attention, and are disciplined to clean up after themselves and obey the guide. The classroom itself remains orderly from the beginning, as the guide and assistant prepare it perfectly before the kids arrive each morning and make sure that the kids put things away as they found them. Myth #9: Montessori education is not strong in math. Truth: One study suggests that Montessori better prepares young students for math than do traditional schools. When followed correctly, the Montessori method lays an amazing mathematical foundation. The mathematical materials provide the kids with sensorial, concrete representations of mathematical realities, such as number, the relationships between sizes, binomial and trinomial patterns, geometric patterns, etc. When kids are still in the stage of the absorbent mind (0-6) they unconsciously absorb these realities by working with the material. At first all math work is done concretely, by adding and subtracting with beads, for example, and gradually the kids learn to abstract at higher and higher levels. Myth #10: Montessori education is not balanced because the children just work in the areas they prefer. Truth: While children do have the choice on which work they will do each day, each child receives each lesson. It is up to the guide to make that lesson interesting to the individual child. So every child in a Primary Montessori classroom learn the basics in math and language, just as he would in a traditional classroom. The difference is that children also have the freedom to dive deeper into the areas of their interests and strengths. Myth #11: Kids in Montessori classrooms have to do everything by themselves. Truth: Montessori guides empower children and teach them responsibility by showing them how to do things by themselves, e.g. get their own snack, put on their own shoes, clean up after themselves etc. When given the opportunity, children love to do things by themselves. They show themselves that they are capable, and each step towards independence is a step toward fullness. There are many times, though, when a task really is beyond the abilities of the child. Kids are encouraged to ask for help whenever they need it, and Montessori guides should observe each child’s abilities and never place a responsibility on someone who isn’t ready for it. Myth #12: Kids in Montessori classrooms play all day, they don’t do enough worksheets or real work. The emphasis in Montessori classrooms is on purposeful activity. If a child is concentrating on coloring a picture carefully, this is seen as work. 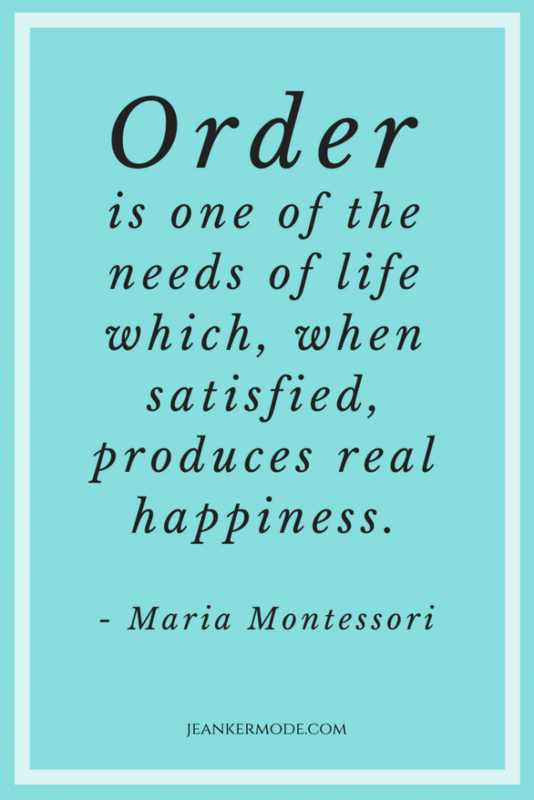 Montessori seeks to help children develop the power of concretion because of the power and work ethic this gives them for their whole life. When a child is interested in his activity, and finds joy in it, he will develop this concentration as well as a love of learning. The guide presents each Montessori material to the child, showing her the right way to use it. If the guide later sees the child using this material in a way that is not purposeful, or that is harmful, the child is told to put it away. There are also plenty of lessons and extensions that involve a pencil and paper and what we often think of as “real work”. Myth #13: Kids in Montessori classrooms do too much work and don’t have enough time for free play. Truth: The Montessori method includes a three-hour work cycle, in which each child chooses work to do and the guide chooses which lessons to give the child. Children usually find their work enjoyable, since they chose it, and acceptable works include painting at the easel, working outside, and reading books in the reading nook. There is always a recess period after the work period in which children play to their heart’s content. Myth #14: Kids in Montessori classrooms are treated too much like adults, they don’t get to just be kids. Truth: The emphasis in the Montessori method is on respect for the child and the amazing powers he has during childhood. There is a fine balance between disrespecting the child, (e.g. double standards, using manners that would be unacceptable with adults, etc.) and treating him too much like an adult. The Montessori method seeks to find the middle ground, by encouraging independence, finding joy, respecting their abilities and limitations, and having fun. Myth #15: Montessori doesn’t prepare kids well for traditional schools. Truth: A Montessori education prepares a child well for traditional education. Through Montessori, the child learns self-discipline, obedience, work ethic, concentration, courtesy, and social skills, and most importantly, a love of learning. One study suggests that young Montessori students are well prepared for language and math, and show superior social skills and executive functioning. Myth #16: A Montessori education only works for certain children. Truth: The Montessori method has been successful in many different countries, cultures, social classes and generations. How? It addresses themes that we all hold in common: love, independence, community, work – yet it recognizes the uniqueness of each person. The Montessori method is based off of observation, not just ideas. Maria Montessori began developing the method to help intellectually disabled children, and achieved internationally recognized success. She went on to use the same principles working with many different children of varying abilities. Maria Montessori spent years caring for children in both Italy and India, and she studied what actions and materials helped them thrive. She observed children and fine-tuned her work for the rest of her life. A common complaint is that the Montessori method doesn’t work for high-energy children, because they can’t sit still and concentrate. A good Montessori guide would give a high-energy child all the outlets he or she needs. Montessori classrooms are supposed to include an outdoor environment, which can be helpful for high-energy children who need to hammer nails, bang on drums, dance, etc. Through these outlets, even high-energy children can learn to concentrate. Pin me if you found this helpful! 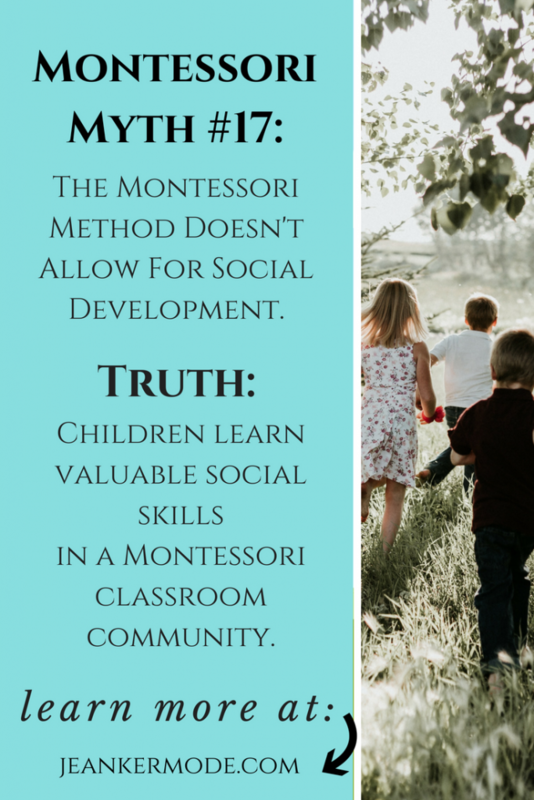 Myth #17: The Montessori method doesn’t allow for social development. Truth: The Montessori method teaches grace and courtesy lessons, such as how to ask for help, how to excuse oneself, how to apologize, how to welcome someone, how to wait and when it is acceptable to interrupt, etc. Any social situation that arises is addressed with a grace and courtesy lesson. And because each Montessori class includes children of mixed ages (e.g. 3-6, 6-9 etc.) the children learn to interact with other ages. They learn to help those who are younger than them, and respect those who are older. During the morning work period they are encouraged to work independently to focus on concentration, but this does not preclude interactions between children, not to mention the collaboration involved in setting up for lunch, and the time spent on the playground or during the afternoon. The reason for the independent work in Primary (3-6) rooms is because for the first 5-ish years of life, the child’s main, though unconscious, goal is to build himself, to develop his mental powers and personality. Around the age of 6 he becomes more social and social interactions become more of a developmental focus for him. This does not mean that children aren’t social before the age of 6. It just means that they have a different focus. Myth #18: Won’t the older kids intimidate the younger kids in a mixed-age classroom? Truth: No. It’s natural for children to be around people of different ages. The introduction of single age grades is relatively new in human history. By sheltering young children from slightly older children, they might learn to be intimidated, but by mixing the ages younger children learn from the older ones, and the older ones grow in responsibility. It’s a win for both. Myth #19: Aren’t the three-hour work periods too much for kids? Truth: If the children were made to work at one thing the whole time that did not interest them, then it would be too much. As it is, though, children are allowed to move from one work to another, but the three-hour work period gives them time to stay with a work as long as they are interested and develop a deep concentration. At first, the children might not be used to having that much time, but it is good for them. Myth #20: Montessori is just for preschool. Truth: While the “magic,” so to speak, of Montessori does take place during early childhood, Maria Montessori studied the development of older children, too. Montessori elementary classrooms are wonderful, and there are Montessori middle schools, and even a few high schools. They don’t all look like each other, each level meets the children at their current level of development. Myth #21: Montessori is just a trend. Truth: The Montessori method was developed over one-hundred years ago, at the beginning of the 20th century. It has since been found successful all. over. the. world, with a current estimate of 20,000 schools worldwide. It was introduced in the United States in the early 20th century, and came back for good in the 1960’s. While the popularity of Montessori education in the United States may be increasing, it has lasting principles that will outlive any trend. 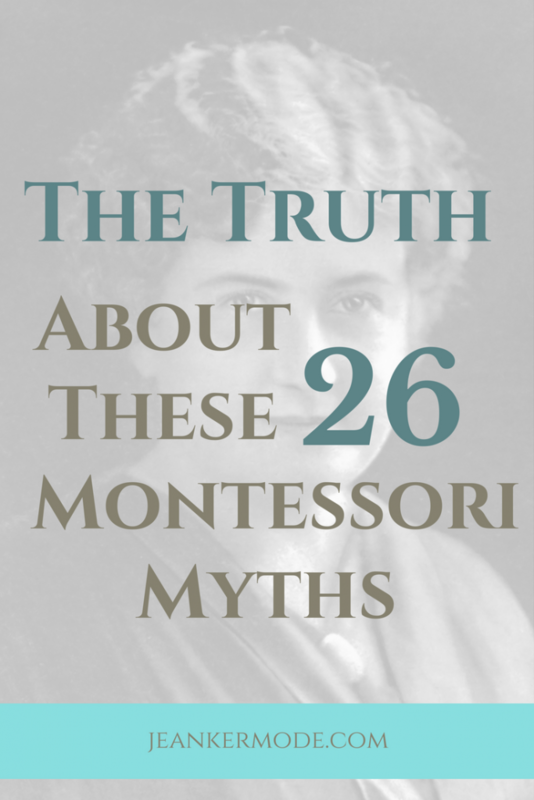 Myth #22: Montessori education is outdated. Truth: The Montessori method was developed based on observation, and it is continued to be taught based on observation. The truths of human nature and development are not outdated, and the Montessori method is at the service of these truths. Myth #23: The Montessori method is religious. Truth: While the Montessori method is compatible with the Christian faith in particular, and other faiths as well, the method itself has no religious affiliations. For example, Maria Montessori writes about working with Hindu, Christian, and Muslim children, and many Montessori schools are completely secular. Myth #24: Montessori classrooms are not safe. Truth: The Montessori method seeks to give children a safe environment to learn the skills to live confidently in an unsafe world. For example, children are allowed to handle breakable objects, and they learn to treat them with care. However, the guide and assistant are responsible for cleaning up any broken glass or dangerous pieces. Myth #25: The Montessori method is all about expensive, special materials. Truth: While the Montessori materials were carefully designed by Maria Montessori with the child’s development in mind, these materials are not at the heart of her method. The role of the guide is to connect the child with the world, and if she has access to the Montessori materials to help with this, that’s awesome. Even without the expensive materials, the guide can implement the Montessori philosophy to help children grow towards independence and fulness. 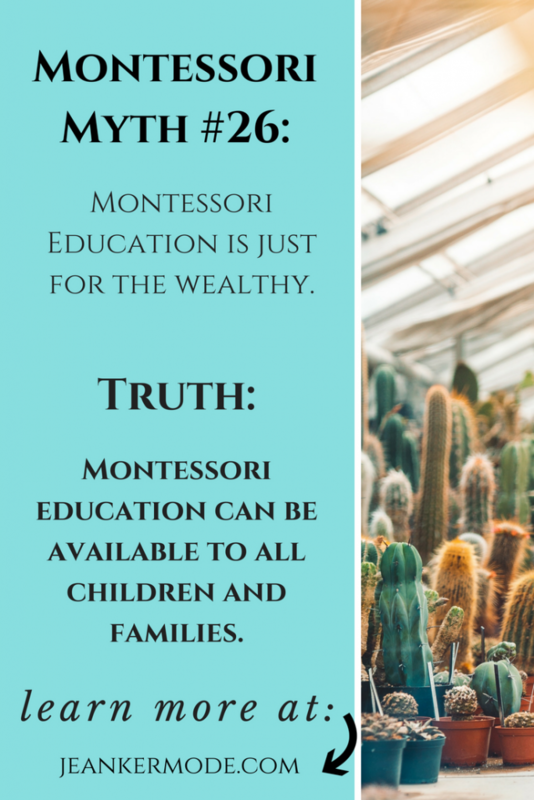 Myth #26: A Montessori education is just for the wealthy. Truth: The Montessori method was developed in the slums of Rome. It is certainly not intended for just the wealthy. While many private Montessori schools currently charge a large tuition, Montessori schools are catching on in the public sphere as well. The Montessori method can be used in homeschool and co-op settings. Remember, it’s not about the fancy materials. It’s about the philosophy, the attitude towards the child, and observation. And I will do my part as well. If you cannot afford my Montessori services, let me know. We will work together to find a price that is affordable to you. Am I missing any Montessori myths? Let me know your objections in the comments! Is there anything you’d like to hear more about? Let’s chat! If you found this post interesting or helpful, please share it!